Dr. Arvanitaki draws on technologies and techniques from other fields of physics to explore the nature of dark matter, black holes, extra dimensions and other fundamental questions of the universe. Her small-scale experiments are a relatively new approach in particle physics. Much research in this field is typically concerned with the “high energy frontier,” which requires huge colliders to smash particles. Dr. Arvanitaki focuses on tests at the so-called “precision frontier.” To that end, she uses high-precision measurements in experiments that can be small enough to fit on a table top. Dr. Arvanitaki holds the inaugural Stavros Niarchos Foundation Aristarchus Chair in Theoretical Physics at Perimeter Institute in Waterloo, Ontario. This fund supports pioneering research into the universe and fosters ties between the Institute and Greece. She joined the Institute in 2014, after earning an undergraduate degree from the University of Athens and a PhD from Stanford University. The New Horizons in Physics Prize of $100,000 is awarded to promising junior researchers who have already produced important work. The prize is funded by a grant from the Milner Foundation. 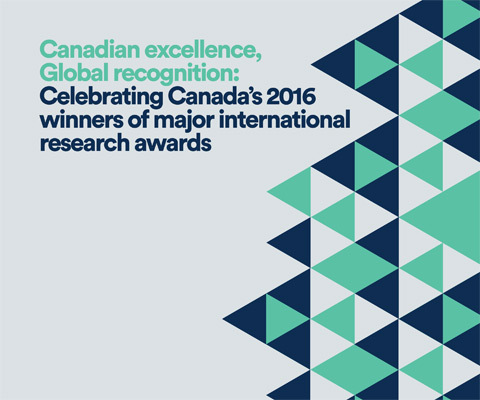 *Asimina Arvanitaki is one of 12 Canadian winners of major international research awards in 2016 featured in the publication Canadian excellence, Global recognition: Celebrating recent Canadian winners of major international research awards.